Between fire drills and warning signs on every emergency exit, schools will do anything to keep their facilities, and more importantly students, safe. However, besides the initial instruction and occasional inspection, how prepared are most schools for fires and emergencies? For low-costs, Moffitt offers affordable Heat and Smoke vents for schools to keep students and the building safe in the event of a fire. How do Heat and Smoke Vents Work? The most common cause of death during a fire is smoke inhalation. This is due to the smoke not being able to leave the closed environment. With our heat and smoke ventilation systems, you have two primary benefits. Our vents exhaust heat and smoke to help protect the building, its personnel, and its contents. In addition, large buildings, such as a school, can be difficult for firefighters to navigate during an emergency. However, with heat responsive ventilation equipment, you can make their job safer. The addition of proper ventilation to your school will assist firefighters in accessing the source of the fire and improve their ability to take action. 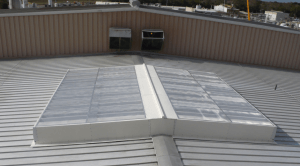 What Options do Schools Have for Heat & Smoke Vents? When it comes to heat & smoke vents, Moffitt has the best option for Heat and Smoke vents for schools. 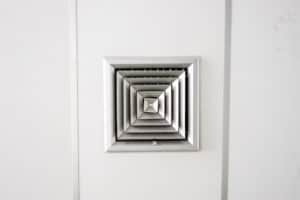 The Moffitt Firex™ automatic heat & smoke vent is known for its excellent craftsmanship and affordability. It has become manufactured since 1956, and tens of thousands of Firex™ automatic heat & smoke vents have produced in that time. Research and development has been continuous and the design has become improved upon, but the Firex™ remains the same great product it has always been. One of the Firex™ vent’s best features is the translucent panels that provide natural daylighting. Daylighting is extremely beneficial for letting in natural light and boosting productivity. People choose Moffitt because our ventilation systems work. If your school is lacking proper ventilation, then it’s time you invested in an old concept with superior technology. Moffitt is one of the most trusted names in Ventilation and Smoke Extraction devices. If you would like to learn more about our products and services, contact us today!